I have multiple Mac devices. I have an iPod, iPhone, and a MacBook Pro. I don’t experience many problems with the first two devices I own. But with the MacBook Pro, I’m seriously frustrated about its slow performance. It’s super slow and I can’t get to work much with it. One thing that might be causing this is the fact that I have too many apps inside it. How do I clean my MacBook Pro of these apps? Most Mac users have devices that are filled with a HUGE AMOUNT of unnecessary apps. These apps are causing a lot of problems on these Mac devices. They consume too much space and causes Mac devices to slow down. Sometimes, it even results to the complete crashing or even shutting off of the Macs. Deleting these applications is not an easy task. Many people think it's easy to do. However, it's actually complicated. These apps take up much of your Mac’s disk space. When you simply delete these apps, you're not clearing up much space as you actually can. You need the proper app cleaner to remove applications completely. This will give you more space as opposed to simply deleting the app. A good app cleaner will help you to totally remove an app with just a few clicks giving you your much-needed memory. In this guide, we will show you the best app cleaner available for Mac devices. 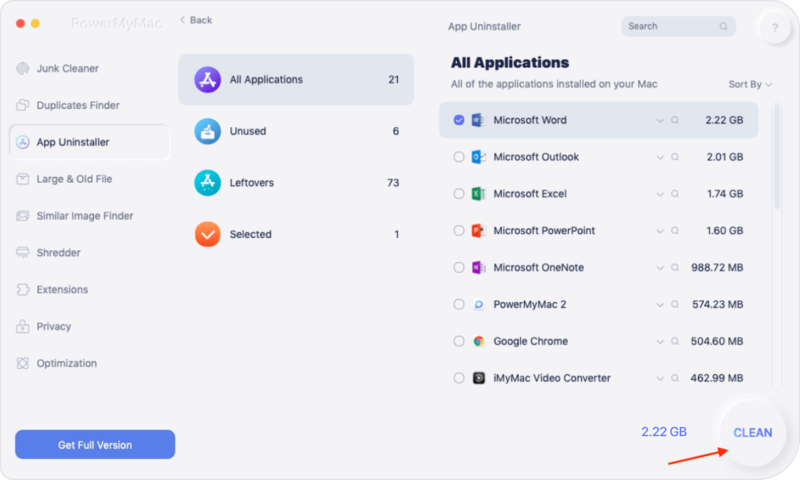 The one we recommend is iMyMac’s Mac Uninstaller. This tool is very powerful and simple to use. But before we delve more into this tool, we’ll tell you how to manually remove applications. When you want to manually remove apps on your Mac, you have to locate its component parts first. Once you have found these parts, you should drag them and drop them into the Trash. To free your device of more space, you can also empty the trash afterward. The problem with this is simple. Parts of your app is not only located in the app’s folder. You can also find them in other sections of your Mac such as in download folders and in browsers. Deleting plugins are possible. However, you have to ensure that traces aren’t left behind. These traces include cookies, cache files, and other junk files that can take up space in your Mac and even clutter it up. 1 - Powerful - It comprehensively scans your Mac for all applications and it can efficiently do the said task. 2 - Efficient - It can completely remove applications you want to delete. It also removes the associated files of the said applications. 3 - Selective - It shows scanned results in a variety of classifications (by time, size, date, etc.). You can preview applications one by one. And you can choose which apps to uninstall. Everything is under your management and control. 4 - Free Trial - You can use the Mac Uninstaller for the first 500MB of your data. You can now experience the power of this tool without having to put out money from your pocket. Step 1 - Download iMyMac-Cleaner and open it in your device. Step 2 - Choose from the modules on the left. Select the module “Mac Uninstaller”. Step 3 - Click Scan to scan all applications in your device. Wait for the results to display. Step 4 - Select the application you want to remove. Aside from applications, plugins and extensions can also cause your Mac to slow down. That’s why you should also eliminate problems caused by these extensions by removing them completely off of your device. 1 - It aids in improving the performance of your Mac device by actually speeding it up. 2 - It helps you in removing unwanted extensions that causes a lot of problems on your device. 3 - It is 100% safe and secure. It does not have any virus or malware that can actually harm your Mac device. It is compatible with any Mac device you can have. 4 - It protects sensitive information you input into the tool. 5 - It has a 30-day money-back guarantee. If you are not satisfied with the performance of the tool, you can simply ask for a refund. 6 - A free trial for the first 500MB of data is available. You don’t have to put out money without experiencing the software first. You can check it out if it actually suits your needs. 7 - It is very easy to use. It has a user-friendly interface. You can do a lot of tasks that will speed up your Mac device with just a few simple clicks. The tool itself is not complicated. 8 - It comes with a free lifetime update and one-on-one support. You can also get help from the website and via email. Step 2 - Click Extensions Manager on the left-hand side of the screen. Step 3 - Click Scan. Results will show a list of extensions, plugins, and widgets on your Mac. Step 4 - Find the extensions, plugins, or widgets you want. Step 5 - Toggle to disable these extensions, plugins, or widgets. Too many applications on your Mac device can cause it to slow down. The best way to speed up your Mac device is to clean it up. How do you do this? You simply have to remove applications and extensions. You can do this yourself manually. However, sometimes, traces of these extensions and applications are still left on your device if you do the cleanup manually. The best way to do the cleanup is to use iMyMac’s Mac Uninstaller and Extensions Manager. The former is used to remove applications completely from your device. While the latter is used to remove extensions that might cause your device to slow down.